there’s a bit of sound adjusment but it sounds pretty solid. Cian Nugent was recorded but pretty much unuseable. Recording of the Cork leg of the tour Stellar OM Source did around Ireland in May 2010. Stellar OM Source is the work of Dutch electronic musician Christelle Gualdi, she plays a style along the lines of the modern synth exploration sound but mixed with a techno style as well. 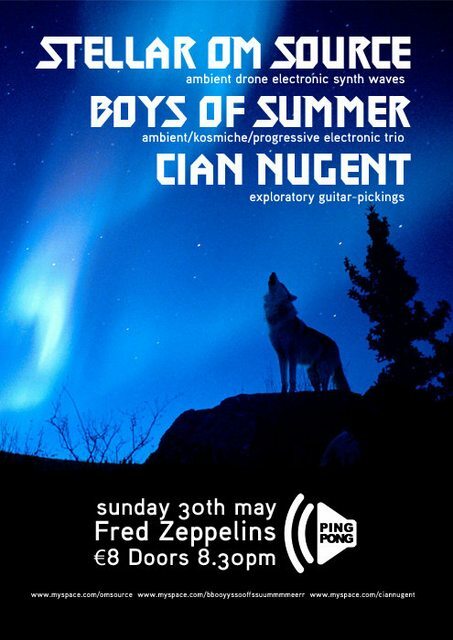 Boys Of Summer are the Irish komische synth goup (at this point still a trio) we all know and love. Gig itself was pretty good even if Freds is a tiny venue which probably can’t fit more than 50 people.